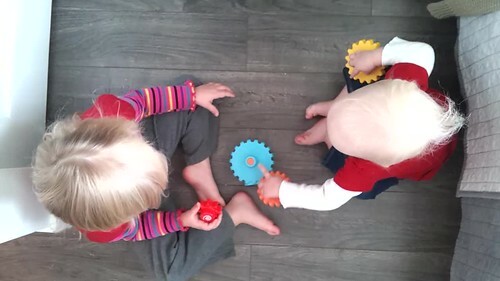 Little Tikes has an ever-growing line of baby toys that have interchangeable plastic gear parts called Giggly Gears that range from $10-40 USD. 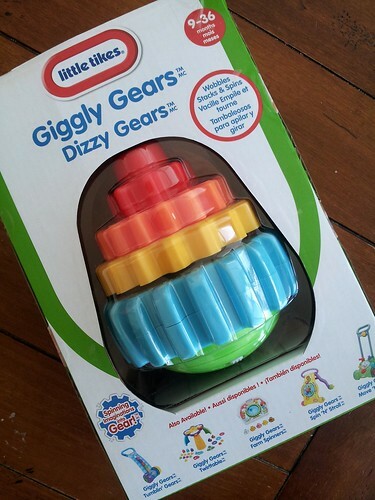 The most affordable item in the set is called the Giggly Gears Dizzy Gears, a battery-operated toy that jiggles around while baby stacks the gears on top. 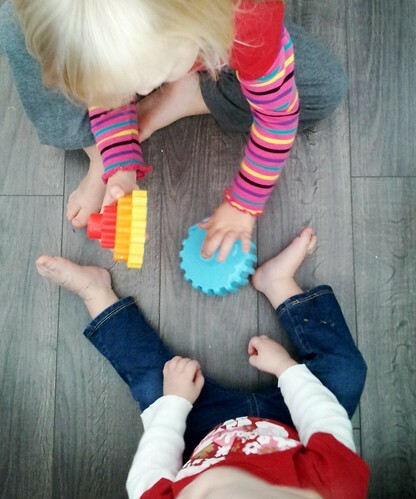 The Dizzy Gears toy is appropriate for babies 9-36 months old. My 17mo and 3yo both have had fun playing with it. For $10, this toy is a great deal and good option for a gender-neutral holiday gift exchange. 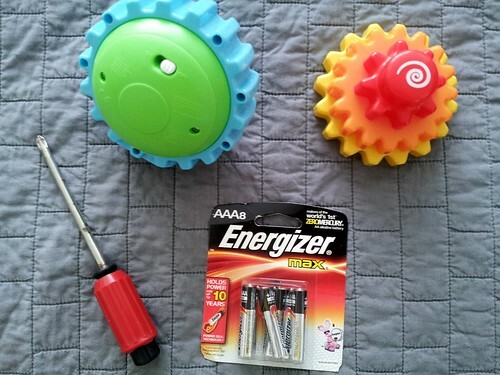 The toy requires two AAA batteries (which are not included) and a small cross-headed screwdriver to open the battery plate on the bottom. My three year old got a big kick out of helping me unscrew the plate and install the batteries. Little Tikes suggests this toy is fun for “hours on end.” I’m not sure I would go that far, as the toy is limited in its function. BUT, both girls have had fun playing with it for 10-15 minutes at a time throughout the day. While I think this is a fun gift for a baby, a great value for the price, and a good option for a gender-neutral holiday gift exchange, I must warn that this toy is surprisingly loud. Watch the video above to see/hear the toy in action. Then check out the Little Tikes website to see the other toys in the Giggly Gears lineup to get more fun out of these interchangeable gears. 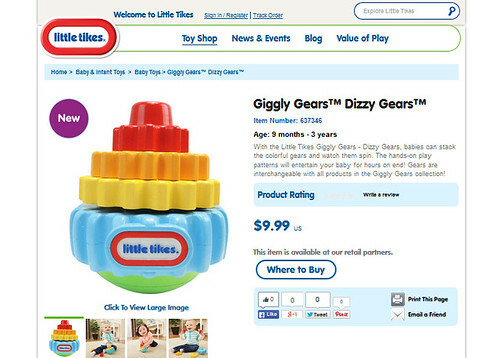 The Little Tikes Giggly Gears Dizzy Gears made our Holiday Gift Guide this year! This looks like alot of fun!!! We love Little Tikes products! We purchased a lot of Little Tikes toys over the years, they never disappoint! Dizzy Gears looks like fun! These are certainly different toys that we usually have but I really like the idea of it! I have seen tons and tons of Little Tikes toys, but have never seen this one. It looks really fun and interesting.